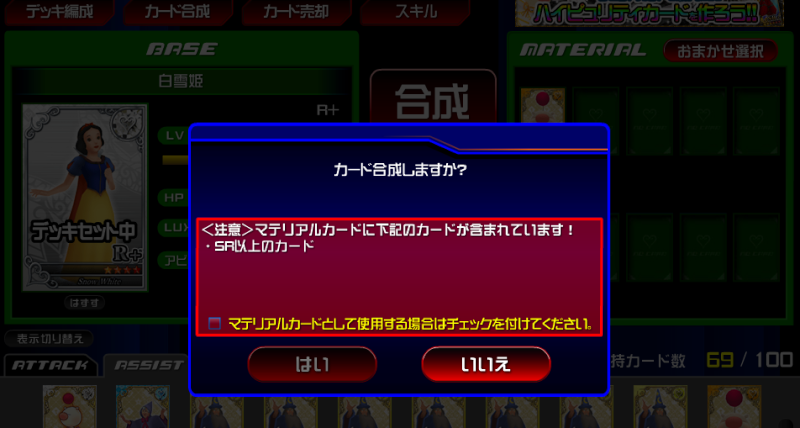 I've tried to find out what this message says, but haven't found anything. Can somebody tell me what this says please? The message is just alerting you that you're about to use a card of SR rarity as a synthesis item. They added that feature a long time ago. You really have been away awhile. It's hard know where all that loot came from. There has been a campaign the last few days, since KHUX was announced, where they've been giving some extra things (potions, raise tickets, the like), and there was a very good giveaway a few days ago that included an SR+ FGM. But by the looks of it, you've got at least six SR+ YS, and these wouldn't account for that. Are you in a party? I'm not sure how the game treats party rewards if you're inactive, but that could explain it. I'm perhaps not the best person to speculate. As far as events are concerned, there's an Invisibles event right now. They increase in level as you fight them. Check out p562 and p563 of the Walkthrough Help thread for some brief discussion on it, if you'd like to know how it works. It's more complicated than a lot of other events. There will be an update this upcoming Thursday that will refresh the moogle shop, and we're supposed to get new Wonderland story missions, I believe, but don't quote me on that.